Alright, this is a little late, but I felt like getting the ball rolling for another year of high school football. Unlike in previous years, my schedule will let me be home every weekend (or virtually every weekend) this fall. One of the benefits of working for yourself. But, I still like to see games. And this year is no different. My season started earlier than ever this year as I drove down to Kentucky to take in two days of ‘bowl games’. The first two games were in Nicholasville, Kentucky at the “VisitNich.com Bowl” at West Jessamine High School just west of town. The ‘Bowl’ is the result of Jessamine County being divided into two schools: East Jessamine and West Jessamine. To allow fans to see both teams other than when they play eachother, the thought was to create a bowl to bring in outside competition. The East Jessamine Jaguars hosted the Somerset Briarjumpers in the first game. West Jessamine Colts then hosted Tates Creek Commodores. Now, the stadium is a simple, rudimentary high school stadium. Metal bleachers that allow anything dropped to fall below. All patrons must walk between the fence and stands to go to and from the concessions. The concession stand is way behind the homefield stand in the school building. Which creates a huge common area where students congregated to socialize throughout the night. Another concession stand was setup to the north endzone mostly to accommodate the visitors. The away stands were very small, but it appeared to be more than plenty for the crowd. The field was grass and markers were difficult to read. The biggest complaint with the field and the event was that the home stands face right into the sun the entire lit portion of the games. One benefit of the ‘bowl’ aspect was Zaxby’s was there selling chicken sandwiches. After purchasing three at full price throughout the day, they marked them down to $1 each. Which was the best deal for the crowd. There were no programs, however the State Farm booth handed out schedule cards for the two home teams, which was a nice souvenir. The games themselves were mostly forgettable. The two home teams lost and really didn’t put up much fight despite the scores not ever seeming that far out of reach. After the game, I drove south on US68 through one of the most confoundingly curved roads in America before finally settling for the night near Harrodsburg. The next morning, I toured south-central Kentucky through Campbellsville (home of a four-game two-day bowl event as well) and back east toward Somerset. If you’re in Kentucky, a good chain restaurant is Lee’s Famous Recipe Chicken. Simple, cheap, but very good. I found these restaurants all over Kentucky. And, in addition, try Ale-81, a great ginger ale-like drink. Definitely a favorite when passing through the state. A brief drive through Daniel Boone National Forest and a stop to see Cumberland Falls State Resort Park and I was then heading north to Richmond for two more games on Saturday. After stopping for a pre-game meal at Lee’s (what can I say, it was good), I arrived at Eastern Kentucky University. 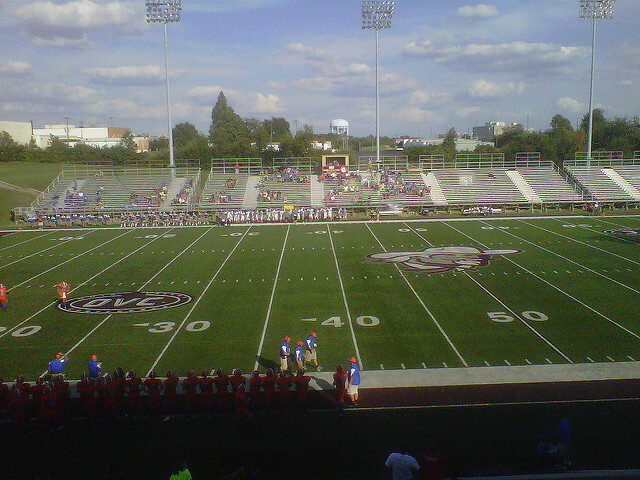 The Kentucky National Guard Roy Kidd Bowl was taking place at EKU’s Roy Kidd Stadium. The stadium is situated along the main loop around town just southeast of the main part of the campus. The stadium seats 14,000 and is situated into two decks on the home side in concrete and a simple metal riser on the east/visitor side. The field is turf with maroon and silver markings and graphics. The scoreboard sits to the south endzone near the road way. For the Bowl, the upper section was closed off. Although the crowd was sparse, seating was cramped and unfriendly. Most the crowd wanted to congregate toward the plastic seat section at midfield, but were spaced out far enough to not allow the best utilization of space. The pitfalls of general admission. In addition, the prices were the normal college prices and for a Division I-AA school, that means it won’t be cheap for anything. One benefit of this game was that they did have programs and t-shirts. The programs were basically the roster sheet and sponsor ads. The first game pitted two non-local teams against eachother with Southwestern of Somerset playing Letcher County Central out of Whitesburg. This game wasn’t as close as the score indicated, but it was enough to keep you interested. The crowd was very small. The ‘homeside’ was rowdy as they weren’t that far away from Richmond. Letcher County Central, meanwhile, was a long way from home and their crowd showed. Only a hundred or so made the trip. In the night cap, local high school Madison Central (of Richmond) hosted Boone County (of Florence). This game was a fun game. It was back and forth and a ton of scoring throughout the first half. Madison Central led 20-12 after one, and 33-24 at the half. In the second half, it was complete opposites. Boone County tallied the only score in the third to make it 33-31. In the fourth, Madison Central netted a field goal to make it 36-31. Madison Central looked to be able to put it away if they could just run down the clock, but their inconsistency resulted in a safety to make it 36-33 with a free kick going to the Boone County Rebels with 51 seconds left. After a seesaw of emotions, Boone County still had the ball with one play left and threw deep only to be picked off by Madison Central. And despite logic dictating that they should kneel, the defender returned it all the way for a touchdown to the cheers of the hometown faithful. After the game, I drove the ‘back way’ home and stopped in Maysville for the night. A small town along the Ohio River, I’ve been through here many times and always liked this little town. All in all, it was a fun weekend out. I will definitely plan for games in Week 0 next year in Kentucky again. Although I may see the four games at Campbellsville (if they do it). 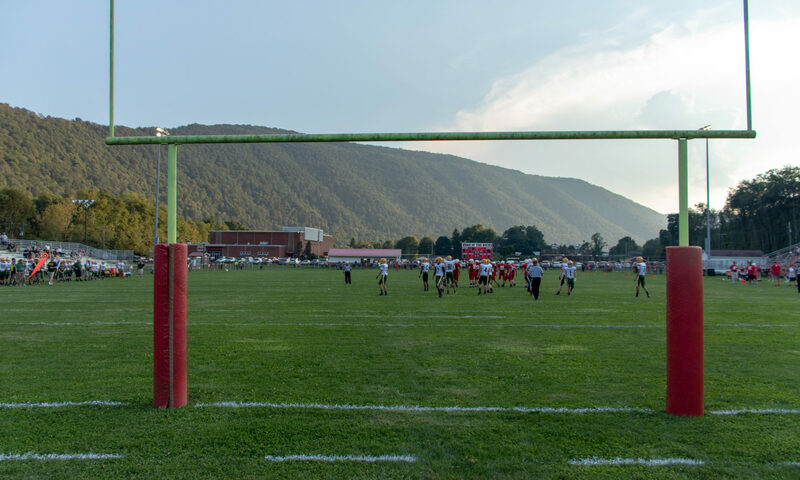 I probably won’t see the Nicholas County games as the stadium just does not suit high school football games as anything more than the local team’s field. Now, last week, I went to ten games in Cincinnati and Dayton. First with the doubleheader at Colerain on Wednesday, the doubleheader at Harding Stadium in Steubenville on Thursday, the doubleheader at Nippert Stadium in Cincinnati on Friday and the quadrupleheader at Dayton’s Welcome Stadium on Saturday. I did not, however see the two games at Kings on Sunday. This year, my schedule will allow me to work Monday morning through Thursday morning and then I’ll be off for high school and NFL games for the weekend. Which will be fun. I do miss the travel the past few years and seeing games all over the country. But, I am looking to see a bit more this year. This week, I saw the game at Caldwell against Buckeye Trail on Thursday. Fun being at the fair and taking in a lot of food that you really can’t justify eating unless you are at a county fair. Deep fried candy bars and cotton candy are strictly ‘once a year’ foods. The game, though, was a blast seeing a game there, even if the home team disappointed the crowd. Buckeye Trail did deserve the win. And last night I was home in Steubenville for the Cleveland Benedictine game. Tomorrow, I’ll be in Bellaire for the St. John-Conotton Valley game and then will head over to Nelson Field for the end of the Bellaire-John Marshall game, time permitting. And then my wife and I will check out the Buckeye Local game against Pittsburgh Westinghouse. This will also let me get a peak at just how tough Big Red’s future opponent will be. Aside from the stray West Virginia or Pennsylvania game, the only out-of-state games I might watch is if I drive to Detroit for the state finals later this year at Ford Field. Otherwise, I’ll just watch the WPIAL Finals at Heinz Field again and throw an OHSAA playoff in the other day. But, I do plan on watching games all 18 weeks this year (0-17, the PIAA Finals). And finally get to watch all 8 Browns games this year after missing most of them the past few years due to being away from home. I’ve also got the tickets for the Steelers game in Pittsburgh. After the season, I’ll go back to working seven days a week. But, for now, I’ll just sit back and enjoy some football. As of 8/31, I’m up to 16 games on the season so far. And I don’t expect much beyond the tri-state area. So, starting next week, I’m going to try and update some out-of-state games from teams I’ve seen previously and updating on the Kentucky schools I saw this year. Teams like Memphis (TX), Grass Range (MT), Jordan Garfield County (MT), Crystal City (MO), Des Moines North (IA), Laurens (SC), Wiggins (CO), Lamar (CO), Green River (WY), Kaycee (WY), Buffalo (WY), Jurupa Valley (CA), Norfolk (NE), Grand Island (NE), Caddo (OK), Albuquerque Valley (NM), etc. Just some news and notes. No recaps, but just to bring to life some teams I’ve seen in the past that hold a small place in my memories over the past couple years. Maybe in the future I’ll do something even more indepth. I still have plans in the future if things work out to really go out and around the country for games. It is possible to see 120 games in one season. And some year, I would like to give it the old college try. With states playing midweek games in the playoffs, with the Crosstown Showdown, the 12 game semifinals at Minneapolis, the four state finals in Madison on Thursday, the Nebraska state titles on Monday and Tuesday, and Iowa playing 12 games in three days, the eight state finals in Detroit, the six in Ohio, nine in Texas. It is possible. Difficult. But, possible.